This is a sponsored conversation by Carter's. All thoughts and opinions (and my love for this brand that makes up 80% of my childrens' wardrobes) is my own. We've had a week of warmer weather here in Arizona and it's making me feel like spring and summer already. (Although as a matter of principle I refuse to turn on the air conditioning in February, heat wave or no heat wave.) It's been warm enough inside my house that I've been putting away the thick footie pajamas and pulling out the lighter cotton ones so the twins don't get too warm at night. Just thinking about the twins and their darling warmer-weather clothes has me excited for the upcoming hot season. After a winter of subdued colors and long sleeves, it's fun to transition to all the bright, light and happy things. And speaking of fun springtime outfits, I can't get over this set I bought for the twins. I love the crisp white of Addison's lace dress, and the underplayed stripes and ginghams of Lincoln's dress shirt. 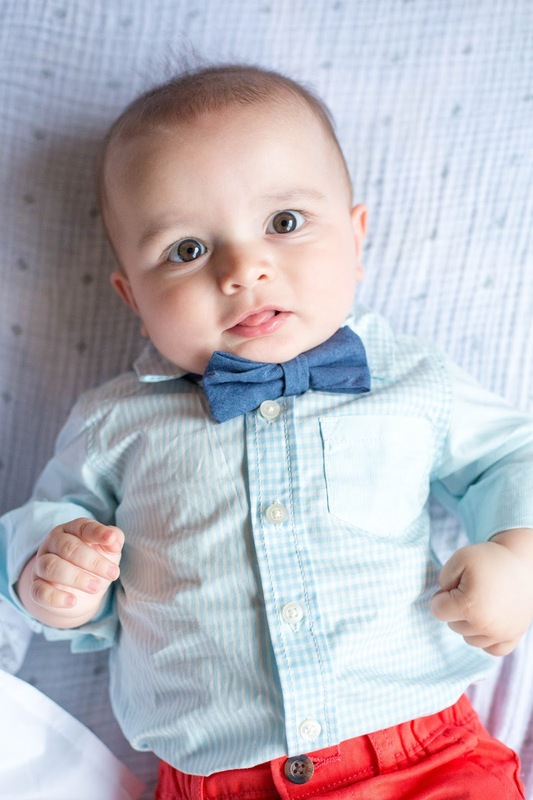 Add the fun red pants and the bow tie (that bow tie peeking out from his tiny fat face!) and these children are ready for the Easter egg hunt at the White House. But seriously, aren't they cute? The above picture is how they spend their days lately. Addison is always rolling everywhere (including right on top of her twin), and Lincoln isn't even phased by it. He's mostly just interested in lying there looking handsome while his twin rolls all over him. 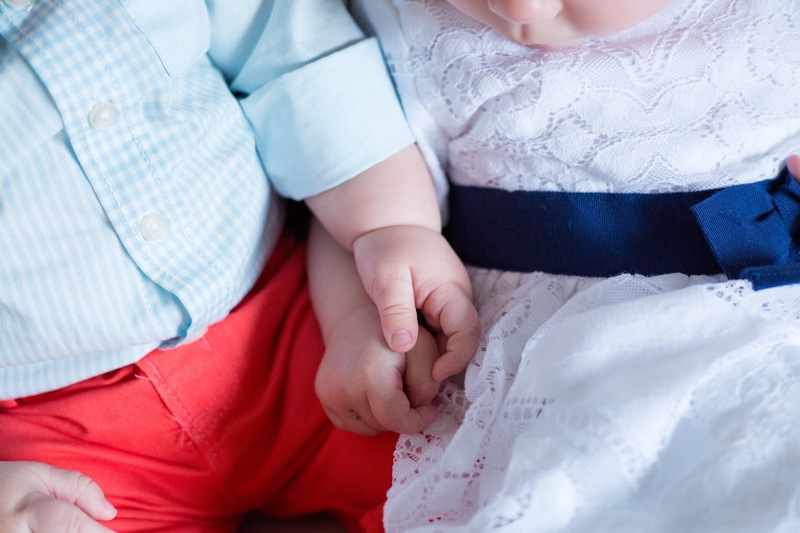 They still try to hold hands all the time, and it's still in my top three favorite things about having twins. 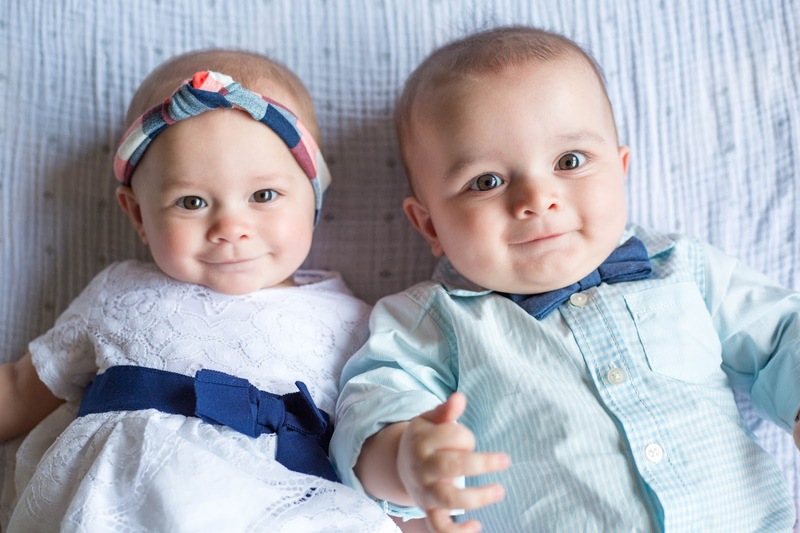 Link's entire outfit can be found here (I love that it comes in a set - all the work of matching and piecing the outfit together is done for you), and Addison's dress can be found here. Link's shoes are here, and Addie's shoes are here (although they are missing in these pictures because her feet are somehow still a size 1 and I bought a size 2). As I mentioned here, I rarely match the twins (the exception is their shoes, which are all coordinating and all neutral so I never have to worry about it). On a day-to-day basis, they wear whatever is comfortable and clean. But I do really like to coordinate their clothes. Coordinating outfits between a boy and a girl who wear different sizes was harder than I originally thought. 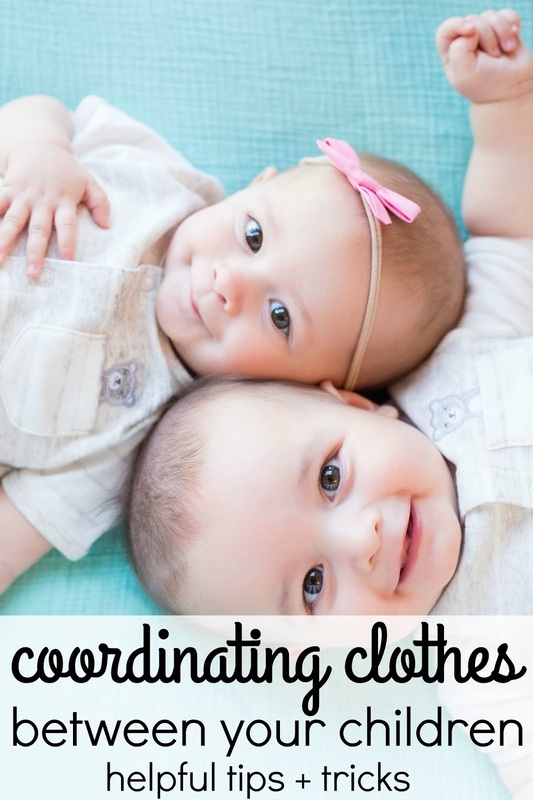 Here are some basic guidelines I follow for coordinating my kids' clothes (I do this with my toddler too). This is my number one tip. If you find red pants at one location and are trying to find a shirt with red stripes at a different store, I can almost guarantee the shades of red won't be a match. This is why literally 80% of the childrens' wardrobe is from Carter's. You can find everything there. 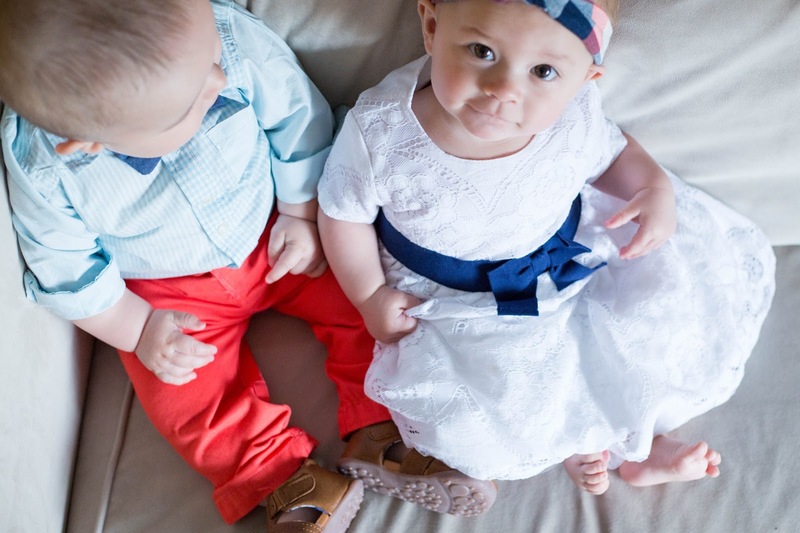 It's a one-stop shop for everyday basics, dressy outfits, layette sets, shoes, and everything in between. One thing I love about Carter's is the huge selection of entire outfits. The work of finding a top and bottoms for one person is done for you. 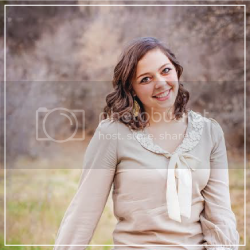 It cuts down the amount of coordinating you need to do by half because you can buy the whole outfit at one time. Another thing that makes coordinating so much easier is to filter by season. Carter's has tons of darling denim and lemon clothes for spring, so if I want all three children to wear denim and lemon, I can just shop the spring line and I know the shades will coordinate beautifully, whereas it would be hard to find something from last fall (yellows are very different in the fall) that matches with a springy yellow skirt. Speaking of denim and lemon, I always pick two or three colors I want in the kids' outfits and stick to those. 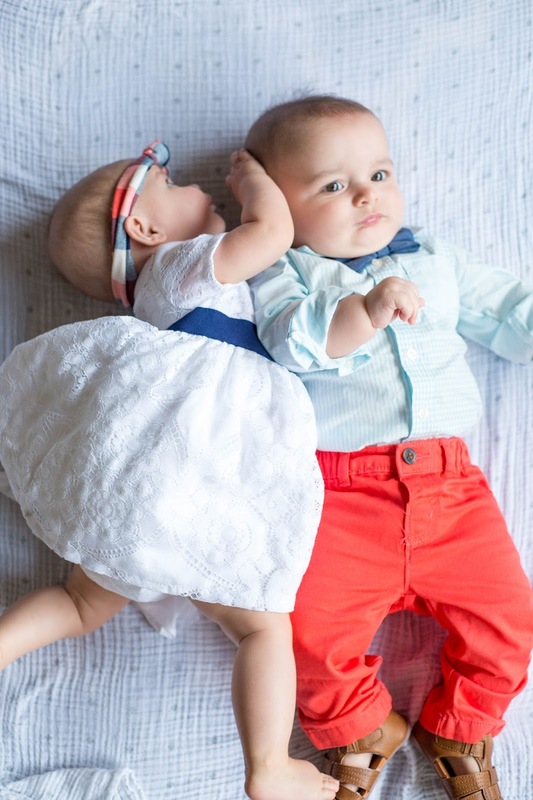 In the outfits above, I chose white, blue, and poppy red for the twins. Narrowing down colors makes it much easier and less overwhelming to find coordinating outfits. 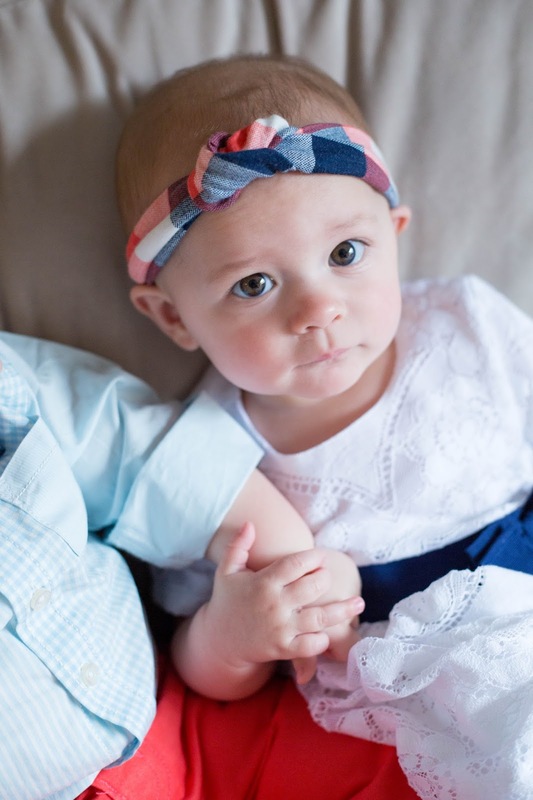 If you're matching clothes between sections (toddler and baby, for example) it can be hard to find the right sizing. Darn those babies that outgrow their clothes so often. ;) I buy the bigger size first (my toddler's 3T outfit) because I know that will fit her for one entire year. Then I pick out my coordinating outfits from the baby clothes section and buy them for whatever season I want them to be worn. Once I bought the same baby outfit in two sizes, because I wanted my daughters to match through several seasons. They matched from July to November last year and it was darling. Now is the time to stock up on warmer clothes for the upcoming season. This spring, think supersoft indigo knits, dip-dyed fabrics, eyelet ruffles, and that denim + lemon combo I love so much. 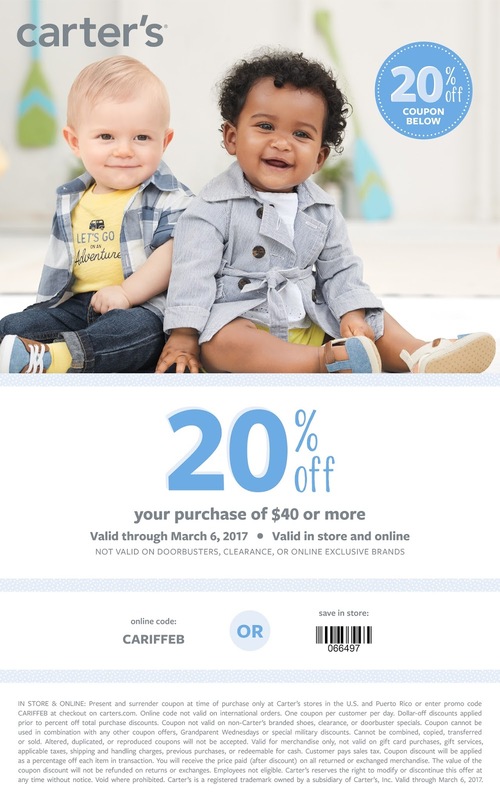 The Carter's February baby sale will be held from 2/21 to 3/6, and here's a coupon you can use online or in-store for 20% off until March 6. Plus there's a HUGE President's Day sale going on right now! 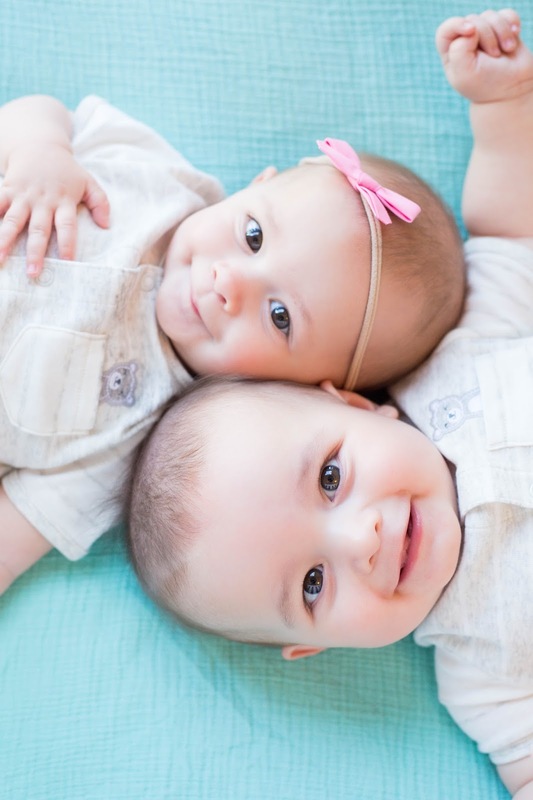 And here are some pictures of a matching outfit I do have for my twins. 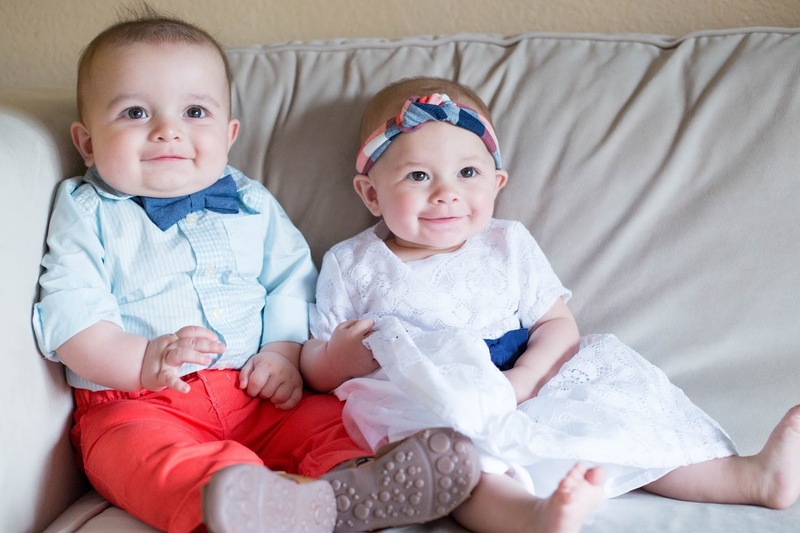 I LOVE rompers on children (only one piece of clothing, which makes it super easy to coordinate both twins), and I'm positive the twins will be wearing 90% rompers this summer. 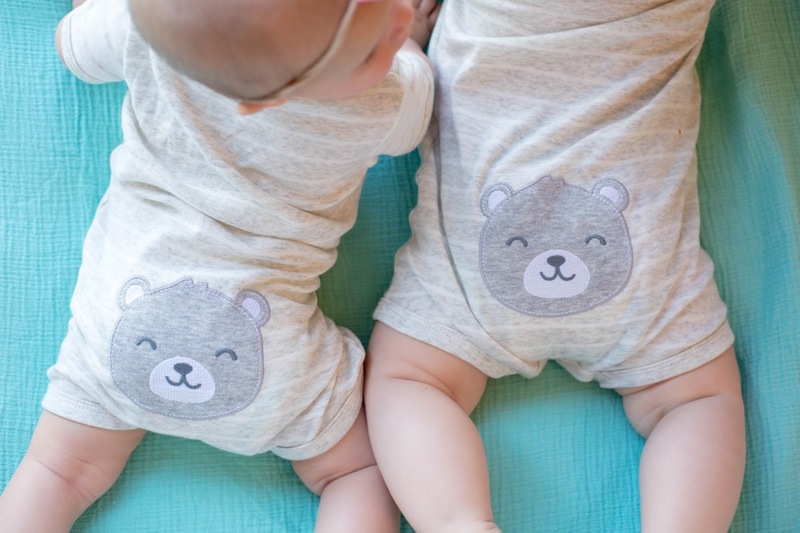 These ones are lightweight, patterned in a neutral, and have darling bears on the bums. What more could you ask for? But seriously. The bear bums! I love it. Do you coordinate your children's clothes?